I saw a preview of this book and I knew that it would be my cover of the week. 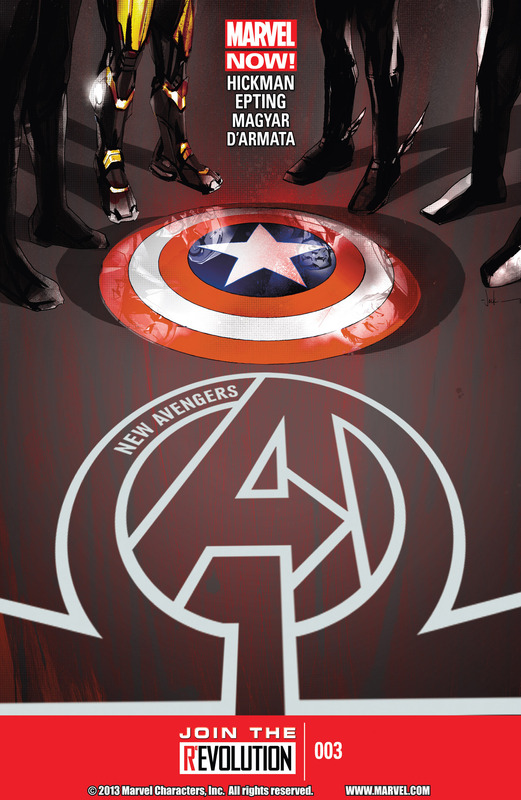 The fallen shield with the rest of the Illuminati standing around, is indicative of the demise of Cap. It’s genuinely a sad image and you would think, if you could see the Illuminati more clearly, that there is remorse in the air. However if we delve further into the image, a more sinister atmosphere prevails. The giant New Avengers sign is draw in perspective, meaning that it is drawn on the floor adjacent to the shield. It reminds me of a white chalk outline at a murder scene, and it’s perfect circle is analogous to the still shield. The juxtaposition of these two images creates the impression that Steve was murdered and that the culprits are surrounding his symbol. It is not only the item most representative of Rogers, but also that of honesty, integrity and justice. The red streaks on the floor and around their distinctive feet conjure images of violence and blood. Iron Man, Namor, Richards and T’Challa do not look so sad anymore, they are looking down, from up high, on the shield demeaning it’s meaning. This is very befitting of the issue and the themes it explores. The faces reflecting in the shield are vague, because we know that ultimately the Illuminati have performed an immoral act and they are deliberating their decisions. I just hope that while they look at their reflections, they can see the guilt staring back at them. Next PostBatman #17 Preview – What the hell is a cloche?